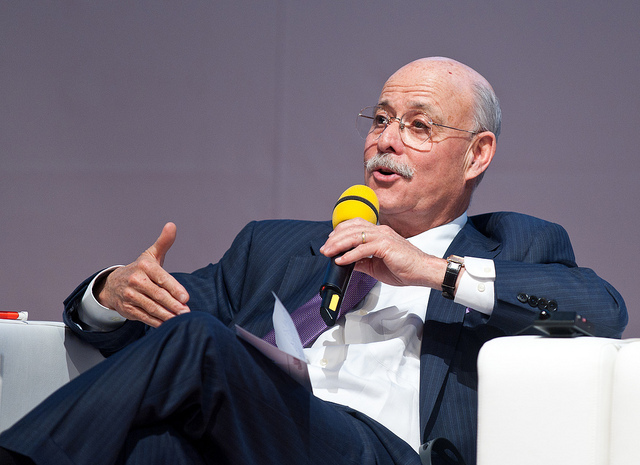 Jeremy Rifkin is an influential American writer whose best-selling Third Industrial Revolution arguably provided the blueprint for Germany’s transition to a low-carbon economy, and China’s strategic acceptance of climate policy. In The Zero Marginal Cost Society – published this year – he describes how the emerging Internet of Things is speeding us to an era of nearly free goods and services, precipitating the meteoric rise of a global ‘collaborative commons’ and the eclipse of capitalism?. He spoke to EURACTIV’s Jeremy Fleming in Brussels on a recent trip to Brussels. How does your new book move your ideas forward? In 2010, when I wrote the Third Industrial Revolution what was not on the radar was the Internet of Things. That is why my new book moves things forward. What we are beginning to see is that a great paradigm shift happens when you have new forms of communications and technology, there is a general technology platform to change the way we approach economic activity. The first industrial revolution featured the telegraph, coal and the steam engine; the second saw centralised electricity, the telephone and the motor engine. The third will see a new convergence of renewable energy and transport. We had the energy in place, but the internet of things is the architecture for that revolution to really move forward. We are going to be living in two economic systems: part market capitalist, part collaborative commons; part sharing economy, part exchange economy. What digitisation allows us to do is to reduce the middlemen and reduce inefficiencies. Centralised telecoms, fossil fuels, carbon-derived energy and internal combustion transport have already maxed out their productivity, they are things of the past. Where do you see the real evidence of your new low-marginal cost model of economy? There are three billion people on the Internet. They share music, commentary, social media and so on. They have all done something commercial online. This means that there is massive scope for scaling up at zero or low marginal cost. What is the cost of creating a video and posting it online now? This is causing massive disruption of industry: look at the music industry following the impact of Napster. The same is increasingly becoming true of broadcast television, newspapers and book publishing. Music, film and books are all intangible products. Where is the evidence that such a low-marginal model can apply in the physical industrial sector? People always said that the automobile sector would never cross the ‘firewall’ into the zero marginal. But look at the increasing phenomenon of car sharing amongst younger generations, and the scope for GPS logistics to revolutionise public transportation systems. Chinese President Xi Jinping has elaborated on Beijing’s plans for a Silk Road Economic Belt initiative, normally associated with Asia. Why do you say there is a strong European angle? Last year I met with many Chinese government leaders there. I was there four weeks ago and am beginning to work closely with the Chinese government. I am very bullish about what’s happening there. China is joining Europe in making a commitment to this [zero-marginal cost] architecture. China is now clear that if you can manage the digitisation process, then you can also move to zero marginal cost. China and Europe are each other’s major trading partners. Eurasia is a contiguous land mass – except for a little blip around Turkey. What happened in the past few months is that [Chinese leaders] Chairman Xi and Premier Li are calling for a new Eurasian Silk Road that will connect everything from Shanghai to the Irish Sea. This is part of a bold new story initiated by the leaders who have had serious discussions with Berlin in the past few weeks, with the aim of connecting the two continents with a high-speed rail link and to creating a renaissance of the ancient Silk Road. I have suggested that high speed rail is just the beginning. That with the EU moving towards big data and the Internet of Things, and with China doing so from the other side, it does not take much to see that a high-tech, digitised platform could link the two. In the end, we could create a technological platform for a commercial space that will take Eurasia into a new era in history of reduced marginal costs. At a moment when the EU is negotiating a huge trade deal with the US, why do you believe that the same does not apply to the EU-US relationship? The shale revolution in the US is a devil’s bargain, which has created a shale gas bubble. All the investors have bought the products, but the shale deposits are gathered in an effective “sweet spot” that will be mined after a few years. The effect has been a downturn in energy prices, but by 2019 those prices will start to rise again. My fear is that the US, Canada and Australia are all relying on the old energy and these countries could be second-tier economies as a result by 2030. What advice for pushing industrial policy would you offer the new European Commission? I worked closely with [former industry Commissioner Antonio] Tajani. Brussels is a complicated place: a series of networks. Getting things done requires getting agreement on a number of levels: subsidiary level, regional levels, national levels before finally getting to the EU stage. You need to get agreements on several levels to move forward. We are now at a critical turning point. The next stage should be quick implementation of the single market through the Internet of Things. This will put the unemployed back to work, because a 25 –year model for transforming from nuclear and fossil fuels to renewables is a big job, you have to retro-fit existing infrastructure. That is highly labour intensive, and with associated work will involve the employment of hundred of thousands as a multiplier across many other industries. The only question is where’s the money. I can show them where the money is: we spend 750 million euros each year patching up the old infrastructure, but there is no more productivity we can eke out of that system.